Last week, I went to Sendai City, Japan to attend the APRU-IRIDeS Multi-Hazards Summer School. This was the first time I’m going to Japan and actually traveling alone, so I did some pre-travel research regarding budget and location of food places. Since I’m a fan of Japanese culture, I already know that I’d most likely be visiting a konbini, specifically 7-Eleven. Oh, and since I was travelling alone, I did not have my Beloved photographer with me, so the qualities of the photos might not be up to standard; gomen. 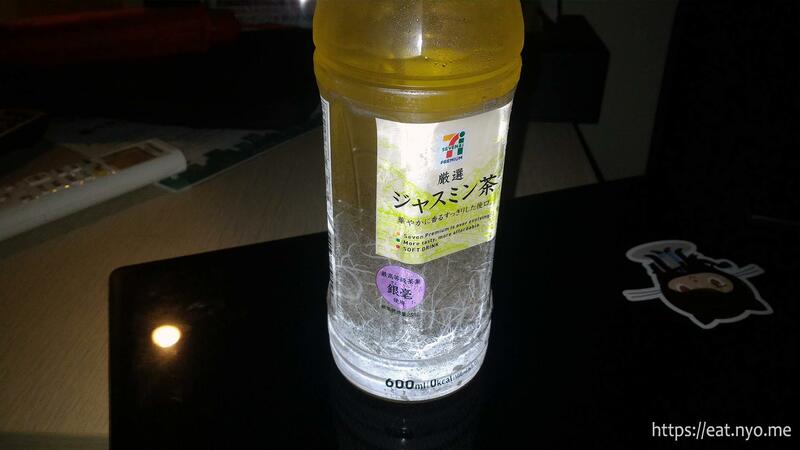 7-Eleven is arguably the most popular 24-hour convenience store, or, as how Japanese calls them, konbini in the world. There are several branches in Sendai City, and, luckily, there was one quite close to the hotel I was staying at. Since I practically grabbed something here every day during my stay, I thought this would be a good article to act as a portal and overall summary to my food adventures in Sendai. When I arrived in Sendai, after checking in my hotel, I immediately changed and went out to the nearby 7-Eleven. While most of the things are in Japanese, some are in English. Also, while I was a bit lost in translation with the locals, communicating with them was possible with the limited Japanese knowledge I have and knowing that they do know some English, they just can’t communicate back. 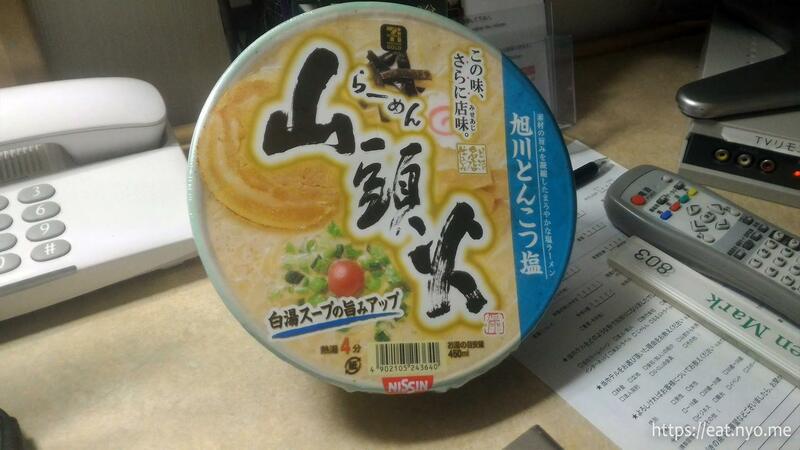 Also, I’m able to translate the foodstuff I bought thanks to the power of modern technology. As this translation might not be perfect, I’d appreciate any comments to correct any mistranslations I have. 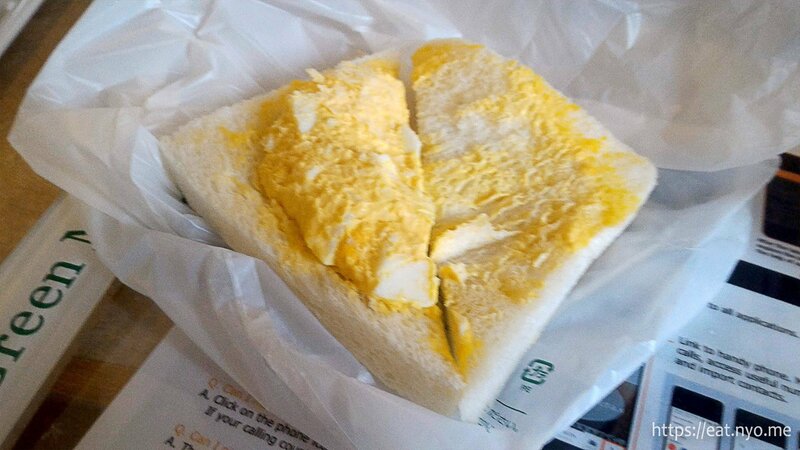 The first thing I got was the Egg and Tuna Sandwich (224 Jpy) because Beloved asked me to buy it and compare how it fares with the “expectation vs. reality” sandwiches we usually have in local 7-Elevens. I also got a drink, their Asahi Clear Cooler (153 Jpy) because it looked refreshing with the lemon and all. When I got to the counter, despite the slight language barrier, I found out that this was actually an alcoholic drink. Whoops. As per request of Beloved, I opened up the sandwiches to confirm it’s quite full. Now, it’s not really as big as the usual triangular sandwich we have, especially since the crust was cut off. 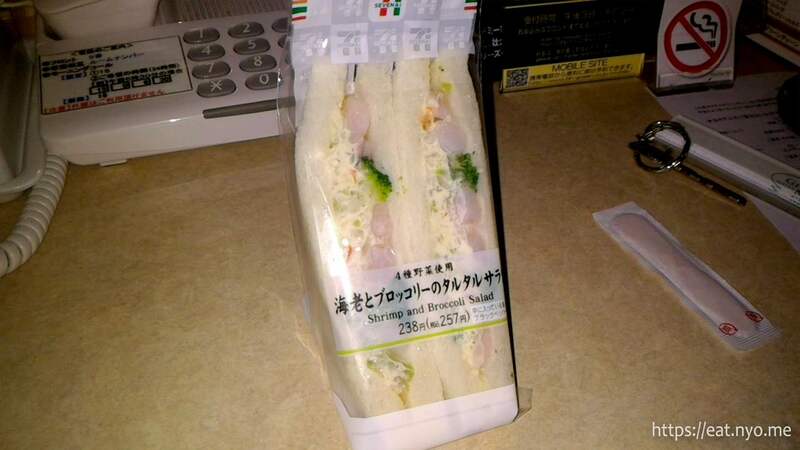 I’d compare it size-wise with the smaller sandwiches we have locally, like the kani salad. However, it’s definitely quite full. I like the fact that there’s a bit of firm white bits in the Egg Sandwich. 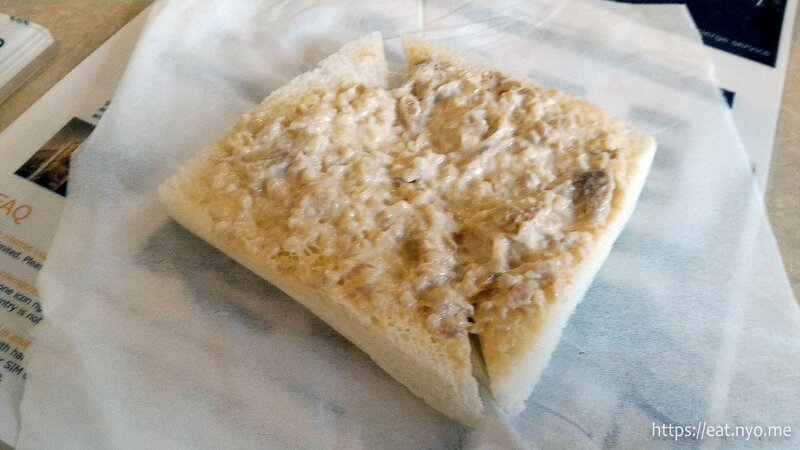 The same amount of filling and similar firm tuna bits were present in the Tuna Sandwich, and I’m quite glad that they combined two variants in one pack. This would definitely pass for a snack or even a light lunch. My Asahi Clear Cooler proved to be quite a nice refreshment, with just a hint of lemon as advertised. Be forewarned that it was definitely alcoholic, much like a shandy. As my first day in Japan was not the start of the summer school, I took the opportunity to explore the area and complete my first of a couple of missions in Sendai. Since I learned that there’s an Ippudo here, I made it my personal mission to try it out and compare how it fares to what we have locally. I also found a department store where I managed to purchase some gunpla requested by my cousins. I also checked out other konbinis, specifically Family Mart and NewDays, but noticed that what they carry and the prices are similar. In order to maintain consistency and to save some “new things” for my next visit to Japan, I decided to dedicate my entire virgin Japan konbini experience to 7-Eleven. Anyway, I was quite hungry after exploring the area around Sendai Station. Even though most places were closing, since it’s a konbini, 7-Eleven was still open. I managed to communicate that I wanted to order some of their Yakitori (128 Jpy each) along with an Inari Zushi with Pickled Plum and Sardines Onigiri (130 Jpy) and a bottle of Rich Green Tea (108 Jpy). 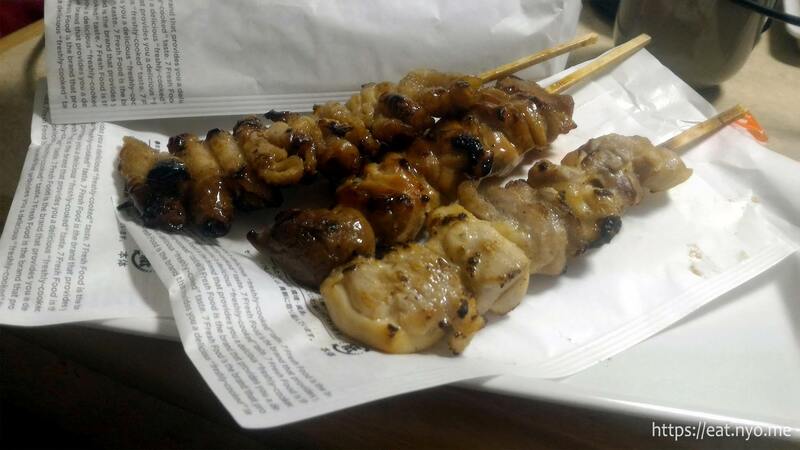 The Yakitori was amazing. Each was packaged individually in its own paper container. They had a nice char-grilled flavor shared similarly between them. This can be adjusted by the small seven-spice seasoning I was given, one for each of them. As an aside, I found it funny and a bit concerning that they provided small individual packets for these, as it seemed quite wasteful. Anyway, as far as I can tell, these were three different parts of a chicken—breast, thigh, and skin. Although the skin was not crispy, I found it the most delicious as it also had the most fat and oils. The breast was the leanest, but also had the most amount of meat. The thigh was a nice middle ground of fatty and lean chicken meat. Perhaps my the most memorable onigiri I ordered in my trip, the Inari Zushi with Pickled Plum and Sardines Onigiri was quite filling. Since I quite enjoy beancurd skin, the outer layer is right up to my alley. The bits of sardines and plum inside provided a slight variance in taste and texture to the soft, slightly sweet and vinegary rice. The Rich Green Tea was refreshing and was a surprisingly nice pair to my light dinner meal. As Beloved has reached home after I had my light dinner, I decided to give her a video call tour of the nearby places as well as a small konbini tour, mostly since all the other places were closed already. I grew hungry as it was nearing midnight and the travel and walking was quite grueling. 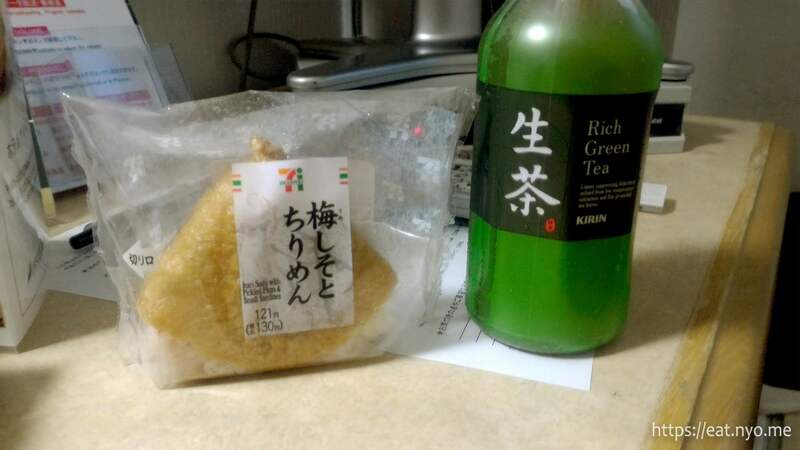 I decided to stop by 7-Eleven again to purchase some midnight snack, particularly a Nissin Tonkotsu Shio Ramen (278 Jpy), a Croissant (120 Jpy), and a bottle of Premium Oolong Tea (149 Jpy, 1.5 liters). I had already some experience with instant ramen from a konbini in Japan, especially this branded kind; specifically, I’ve had Nissin’s take on Ippudo ramen before. This was a similar, but a different brand. 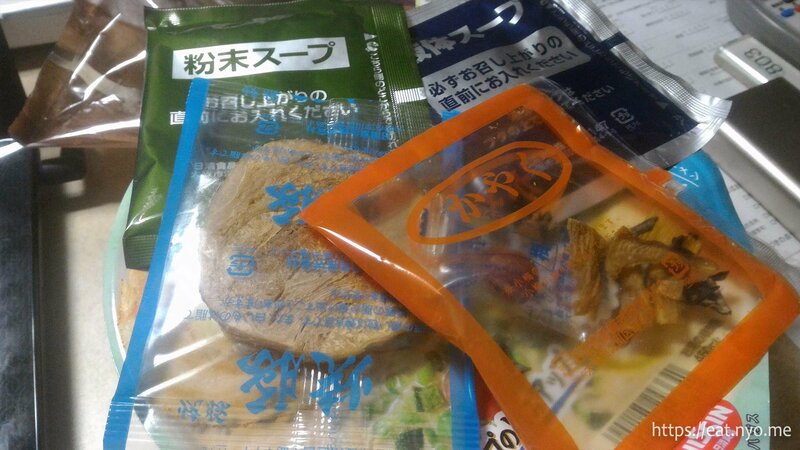 Like that experience, it had a lot of dried stuff along with the flavoring and oil packets. What might surprise some is there’s a piece of dehydrated chasyu, or barbecued pork included with the package. After cooking, I confirmed that this was similar to Hokkaido-style ramen I’ve tried before, with curly noodles and salty pork broth. There’s a strong sesame flavor to it compared to the porky taste, which was a bit milder. The surprising item here was the included plum, which was very salty. 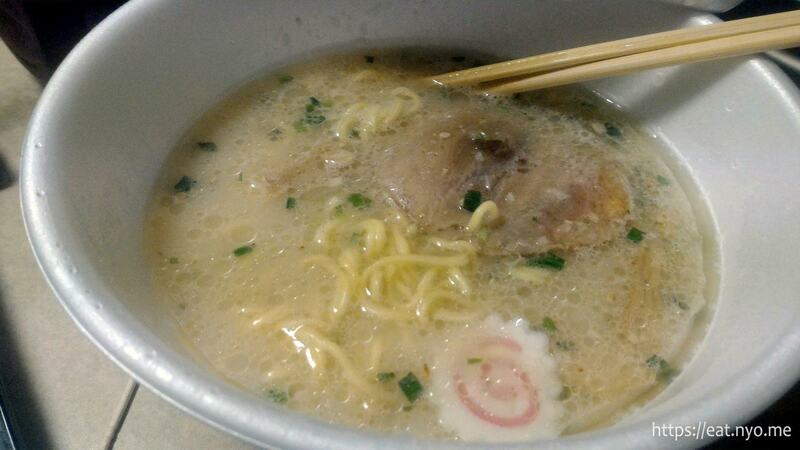 While I did enjoy this, I still prefer Ippudo, both the genuine and Nissin’s instant version. 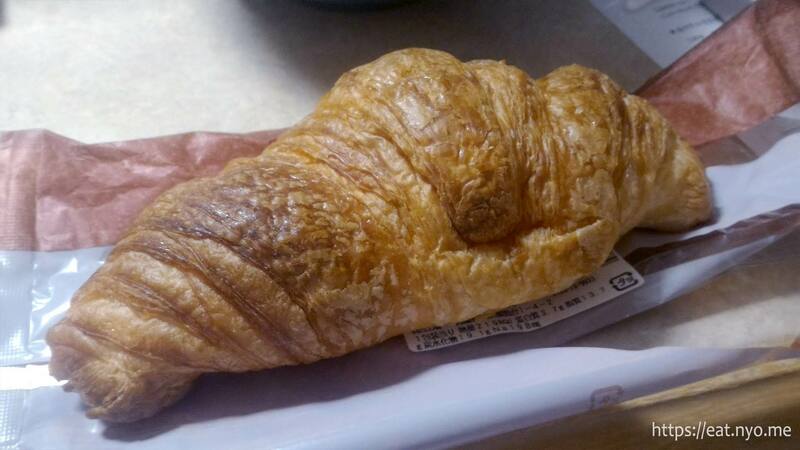 The Croissant from 7-Eleven was genuine and quite nicely done. I’d compare it to the croissant from local bakeries, only a bit thinner and longer. It’s got the expected buttery-flaky textures and not the “fake” croissant plaguing some of our local convenience stores which are basically bread shaped in croissant form. 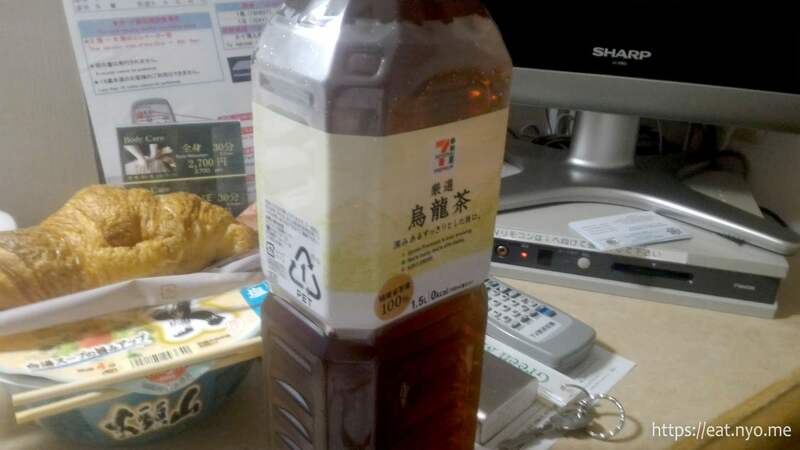 The Oolong Tea was also refreshing; nothing sweet here, but not offensively bitter. Since I got a 1.5 liter bottle, I managed to make this last almost the entire week. As I’ve developed a habit of not eating breakfast, I didn’t have any when I woke up the next day. This was also the first day of the Summer School and I know that I’d be given both lunch and dinner for this day. Since the dinner was practically a feast, I only passed by 7-Eleven for dessert and a light snack. I got a Vanilla Waffle Cone (192 Jpy) because it looked funny, a Choco-Mint Ice Cream (151 Jpy), and a Shrimp and Broccoli Salad Sandwich (257 Jpy). Unlike the usual cone-shaped ice creams I’m accustomed to, this Vanilla Waffle Cone was actually a soft-serve ice cream packaged cleverly. Flavor-wise, I found it not as sugary-sweet as the usual vanilla we get locally. 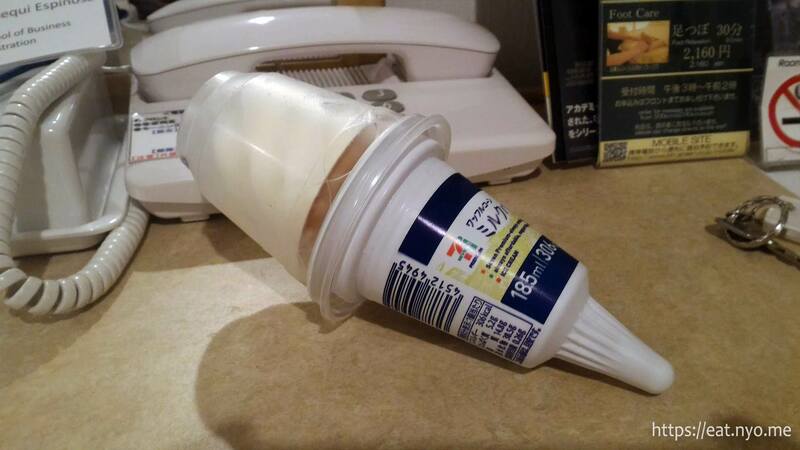 Perhaps this is how sweet vanilla ice cream should be. The Shrimp and Broccoli Salad Sandwich was as advertised. I was glad that there were actual scrumptious bits of shrimp in the sandwich and actual, albeit minced down, broccoli florets. There was also lots of other greens and onions along with a generous amount of creamy mayonnaise. I like this more than the first sandwiches I had in my first day, although they were still similar in how full I got afterwards. The Choco Mint Ice Cream is my top two dessert of the trip. 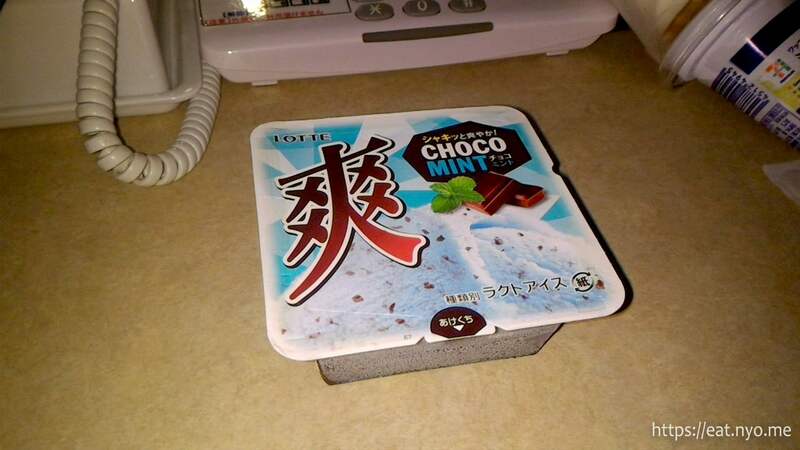 It is as advertised—a choco-mint ice cream. The chocolate part is not too sweet and the minty part is not too minty—just right. I guess this moderate-tasting goes for a lot of things I tried in Japan. My third day in Japan and second day in summer school constituted a field trip to three different tsunami-affected areas near Sendai. Before going, I had coffee at Tully’s as this was near the bus stop where we were supposed to meet. Also notable was having lunch at Ishinonomaki Genki Ichiba. As we went back and befriending new colleagues from the summer school, our small group had dinner at Namaskar. We also passed by Don Quijote which was practically the place to go to for souvenirs in the City. After going back to the hotel and freshening up, I went back to Don Quijote to do my souvenir shopping for Beloved, family, and office colleagues. 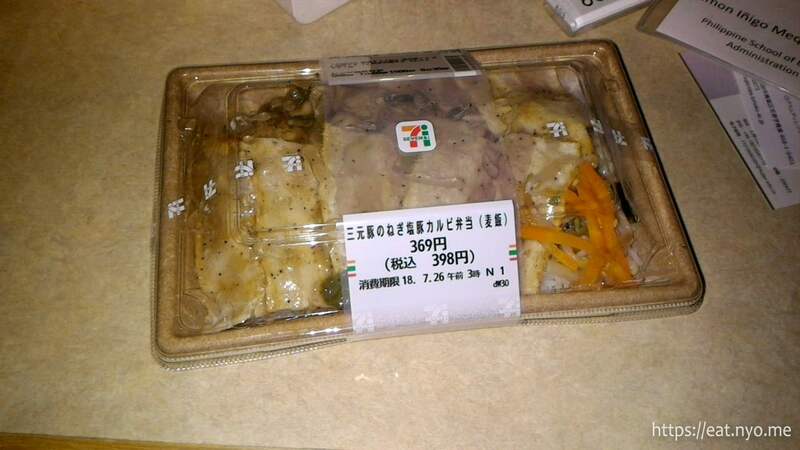 As I grew hungry afterwards, I passed by 7-Eleven again for a midnight snack. 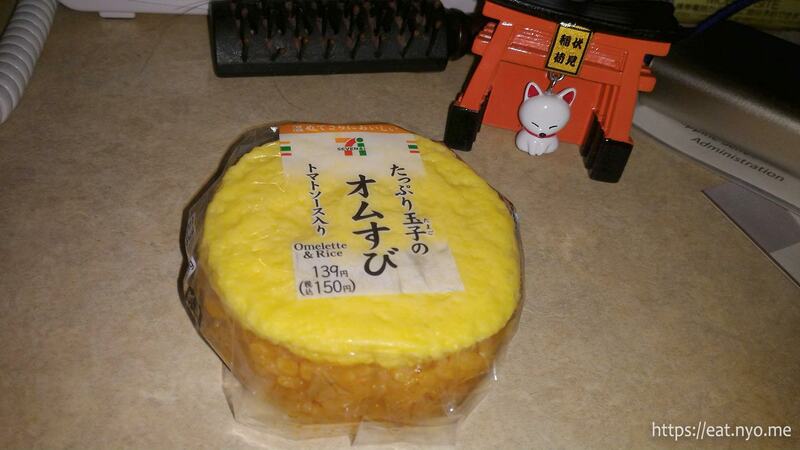 I bought Negima Pork Ribs Barley Rice (398 Jpy) and Omurice Onigiri (150 Jpy), the latter I purchased because it looked funny. 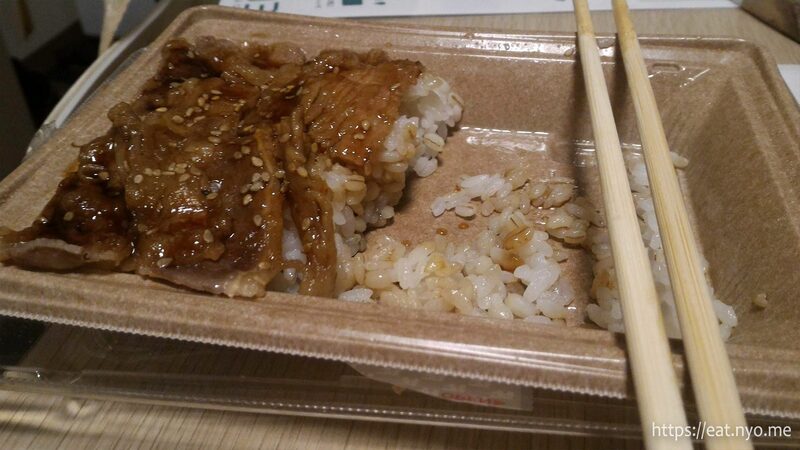 The Negima Pork Ribs Barley Rice became my favorite meal from 7-Eleven I’ve had so far. This is basically grilled pork ribs sliced thinly topped over rice, with some sort of sauce. The sauce was on the sweet-savory side, but, as with other flavors I’ve tasted so far, was pretty mild and balanced. I like the fact that the pork still had some charred taste and texture in it, and it’s quite juicy, perhaps the juiciest food I’ve had the chance to eat so far in my trip. The Omurice Onigiri was surprisingly good. If you’ve had omurice before, this is practically it, even with bits of chicken inside the rice and ketchup acting as a glue between the omelette and rice. Perhaps an improvement would be more eggs, maybe enough to wrap the entire rice around. I’d gladly pay a bit more if they modified it to my suggestion. Day four had me a bit more relaxed and comfortable, since I’ve made quite a few acquaintances already and have basically explored most of what’s around my hotel. For dinner, we went to T’s-tan tan. We did some more roaming at the department store and I went on some more exploring on my own. On the way back, I passed by 7-Eleven again and got dessert—Premium Iced Condensed Milk (300 Jpy) and Melon Pan (118 Jpy). The Premium Iced Condensed Milk is my favorite dessert of the trip. This kakigori was a simple shaved ice-milk bottom is topped with frozen fruits—orange, strawberries, and mangoes. 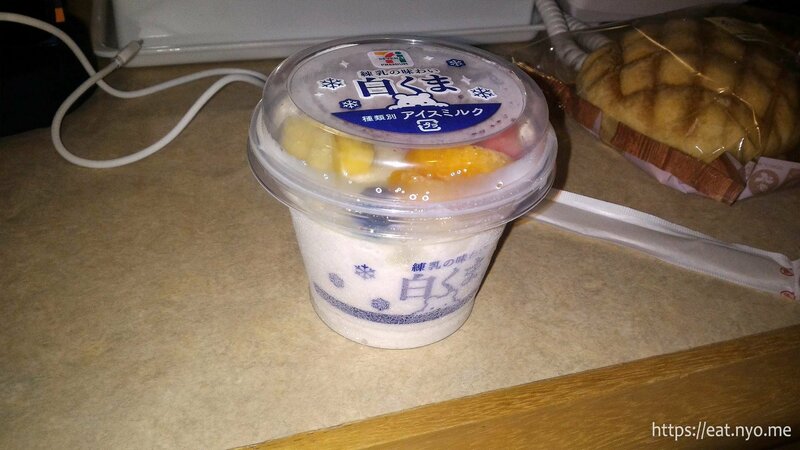 It was quite milky and the fruits still maintaining their natural sweetnesses. I guess the downside is it’s among the most expensive purchases in 7-Eleven so far. 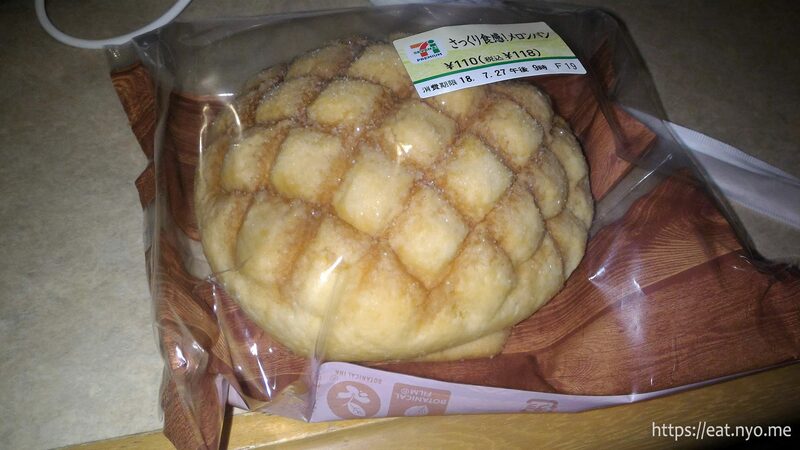 Perhaps strangely, the Melon Pan was the sweetest food I’ve had in this trip. My first impression was that this was like an enseymada without the cheese. The outer crust had some sugary crystal bits and I honestly wasn’t able to taste the “melon” here. Still, it’s okay, perhaps it was just overshadowed by the kakigori. I had some “alone time” at the end of my fifth day in Japan, which was also the fourth and last day of summer school. I accompanied one of the senior participants who was a fellow countryman to Don Quijote (which I was glad to know that he enjoyed a lot and managed to nab some great deals and souvenirs the day after). This day, thinking this will be my last night in Japan, I decided to splurge and try out the region’s specialty, gyu tan or grilled beef tongue at Higashiyama. As per the other days, I didn’t get very full, so I went to 7-Eleven on the way back and grabbed a Chili Cheese Dog (237 Jpy), a Vanilla-Chocolate Wafer Ice Cream, and Matcha Shaved Ice. The Chili Cheese Dog I grabbed because it looked funny. The dog was excessively long compared to the bun. 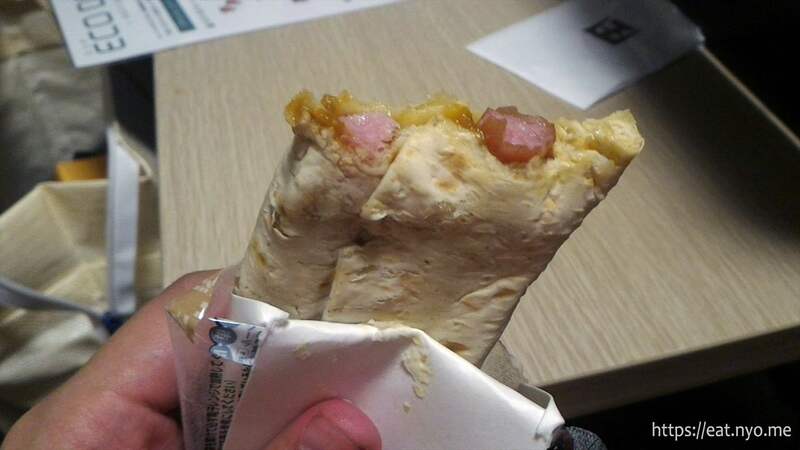 It was just a teensy bit on the spicy side, and I found that the best part about it was the nice bite of the casing of the dog. Otherwise, it was pretty similar to other hotdog sandwiches I’ve had elsewhere. I have no idea what this is exactly, but I grabbed it anyway. 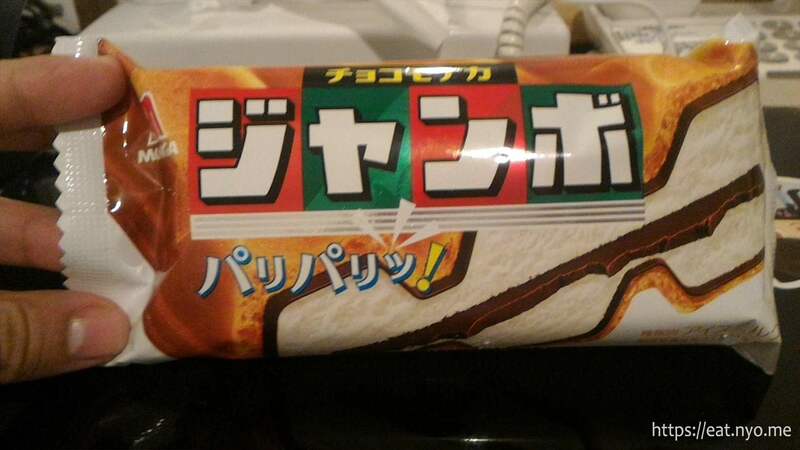 Upon opening, I discover it’s a Vanilla-Chocolate Wafer Ice Cream. Covered in a cubic wafer cone, the vanilla in this ice cream is similar to the soft-serve one in the cone form. The main difference was the biscuit-like chocolate layer inside that provided not just a crunch, but also a dark chocolate flavor. The Matcha Ice was similar to the kakigori I had the night before, only replacing the icy milk with icy matcha and removing the fruits and adding a splash of milk. 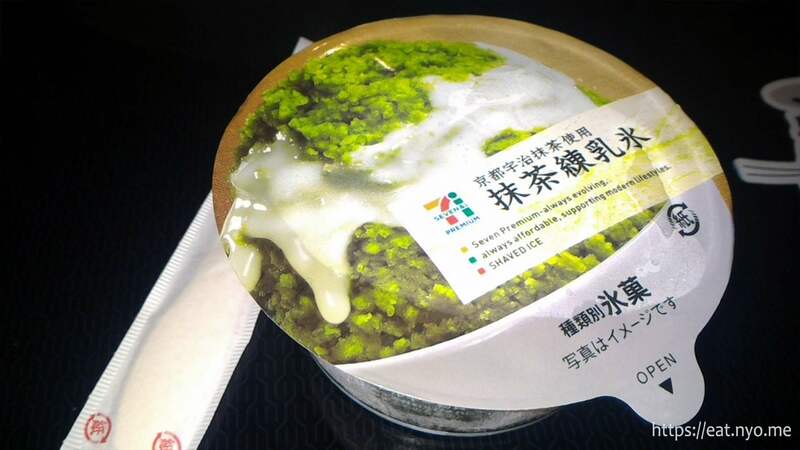 Perhaps the removal of the fruits took a lot from it, as otherwise, it was basically matcha latte in kakigori form. I also packed up that night as I was meant to depart the day after. I met up with some colleagues and saw them off at Sendai Station after having brunch at Bonna Luna. When I reached the airport, I met a couple more fellows from the Summer School as I did some last-minute shopping for omiyage. I also had a late lunch at a restaurant in the airport called Jushoan as my supposed last meal in Japan, consuming all my remaining Yen as they will be troublesome to convert back. I soon learned that my flight was canceled due to typhoon and I was forced to stay at a nearby hotel for the night. Luckily, there was a 7-Eleven around the area, although not as close as the one from my previous hotel. I also learned here that the 7-Eleven accepts debit cards. Since I was famished from all the problems from the flight cancellation, I got their Charcoal Grilled Beef Barley Rice (498 Jpy)—the most expensive item from 7-Eleven that I’ve got. 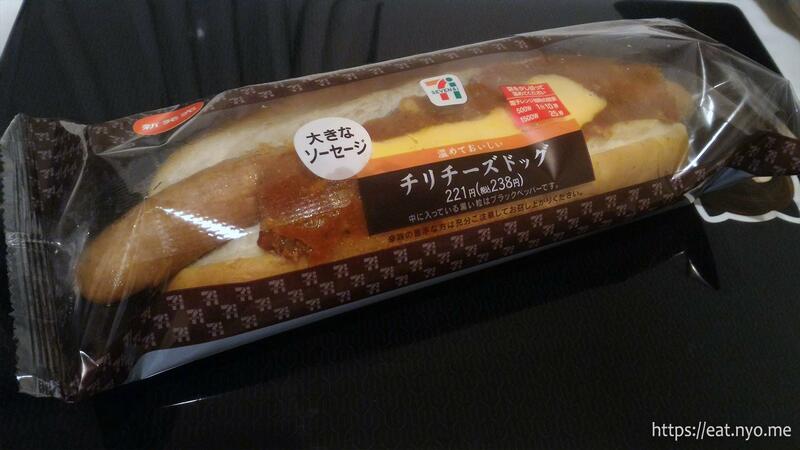 I also got their Cheese Curry Weiner (240 Jpy), a Mango Ice Cream (140 Jpy), and Jasmine Tea (100 Jpy). The Charcoal Grilled Beef Barley Rice, while the most expensive single item I got, was also the best one yet. This juicy beef rice toppings is mostly similar to the pork one I got a couple of days before, just replacing the juicy pork to an even more juicy beef. Despite the fact that it’s the most expensive single item, I felt like it was well worth it. The Cheese Curry Weiner I got because it looked funny. This time, instead of a bun, it was wrapped in a soft tortilla shell and filled with the chili-cheese sauces. It’s was very similar tasting as the hotdog sandwich I had before. I found the tortilla to be preferentially better for me over a bun and worked surprisingly well, albeit a bit messier especially in the last bites. 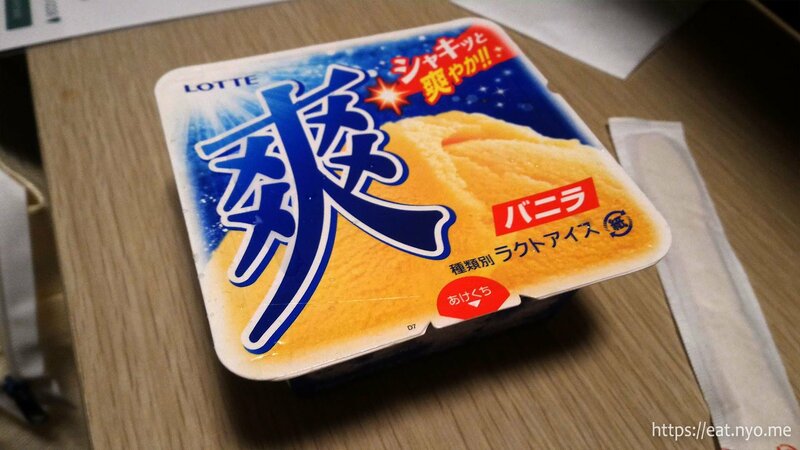 There’s nothing too unusual from the Mango Ice Cream. It really tastes like natural mangoes, just not too sweet, even though this might be totally artificial in nature. Really, I was just picking random drinks and perchanced this flowery Jasmine Tea. I was hoping to get genmaicha, but I guess that’s for another time. After having breakfast at my hotel, the Route Inn Hotel, I was finally able to depart Japan the day after with still a small delay. That wasn’t my last meal of the trip, though, which was in my stopover at Incheon Airport in Korea, where I had an afterbrunch at Sonsoo Bansang, not considering the food my airline provided. The travel took the entire day and was quite exhausting, but I was finally able to reach home just past 10 in the evening after departing at around 1 in the afternoon from Japan. You can read about my other food adventures as they were linked above, but overall, it was definitely a memorable trip for me. One of my colleagues explained that if you’re a new resident in Japan, especially if you’re a student, a konbini lifestyle is definitely one of the more affordable options. What I’d like to emphasize here is that their convenience stores is much superior than what we have locally. Even their instant noodles are far superior as I’ve sampled above. I also want to stress that even though my purchases might sound a bit expensive if you convert it to our local currency, you have to consider that a can of Coke here costs around 100 Jpy. With that in mind, an average meal cost of 300 Jpy, just three times the price of a can of coke, doesn’t sound too bad at all. 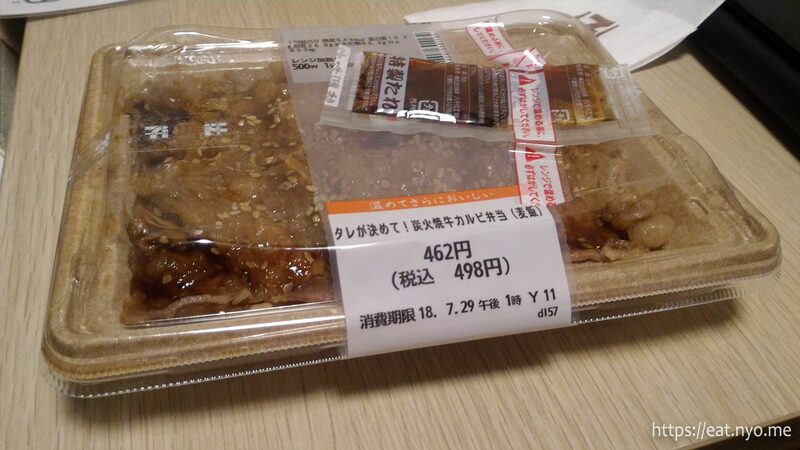 Despite the language barriers, it’s still quite easy to make purchases in 7-Eleven and other konbinis in Japan. It’s also good to note that there’s usually an ATM that accepts international debit (and maybe credit) cards here, aside from the fact that they also accept international debit/credit cards over the counter. As a gaijin, it’s definitely worth to visit, even as extremely as every night, for your munchies while adventuring in Japan. Not recommended for: No, really, you should grab something here at least once. Smart nomnomnom tip: Grab the 1.5 Liter drinks over the 500-600 ml bottles. Locations, menu items, and prices mentioned in reviews are accurate within the published date of the article. This work is licensed under a Creative Commons Attribution-NonCommercial-NoDerivs 3.0 Philippines (CC BY-NC-ND 3.0 PH) License. Inggo Noms… © 2009-2019 by Inggo Espinosa. All Rights Reserved. Made with Hugo using Hugot.